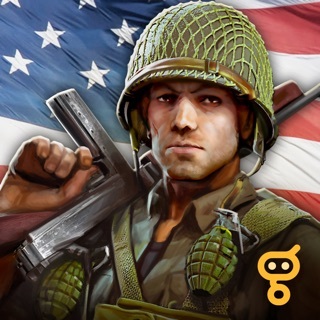 Fight soldiers from all over the world in the best World War II online shooter for iOS! This game will take you to World War II battlefields, where you’ll able to use military vehicles to conduct battles. Battle with military vehicles and numerous weapons, from pistols to machine guns and shotguns. - 7 legendary World War II battlefields! - 4 types of vehicles from different countries: the USA, Russia, Japan, and Germany! - 5 game modes and a custom mode with your own rules! - 57 unique weapon types: pistols, assault rifles, machine guns, shotguns and many more! - Fixed bugs when using first-aid kits and lot's of other fixes and script improvements. So far I have played many mobile games and they were all really good. But when I started playing this, I was blown away. Nothing I had played was better than this. There are some things I would like to see in later updates if possible. A lot of the original maps were amazing and were fun to play on, but with the new updates, they have disappeared. I would like to see the old maps and maybe some new ones. Also, I think there should be more vehicles for the players to control. Maybe a Jeep that two people could ride in and one person could shoot out of the vehicle. There should also be more modes to play like capture the flag or capture the point. When I play this game it reminds me of Call of Duty WW2. One of their modes is where the allies have objectives to complete and the axis has to stop them from completing it. After one objective is done, it goes on to another objective and the map advances. If possible that would be a good addition to the game. Also I think you should be able to pick up ammo and grenades from dead enemies. I can’t think of anything else so I guess that’s it. Anyways I love the game and thanks to The developers for making it. Try focusing on sprinting and graphics and also tank physics like for example the tiger should have the same armor thickness in real life and the Russian t-34 shells should bounce off like in reality and make the tiger slow but well armor and make the Russian t-34 more maneuverable and same with the American m4 Sherman as for the weapons the reloading speed should be a little faster for LMGs and for rifles and For grenades should no explode on contact they should take 5 seconds to explode and for bullet penatration depending on the caliber/tank shell it should pierce threw thin walls and metal same for shells and for armor the helmet should be resistant against pistol rounds and for rife (depending on the power) should take 2-3 rounds to damage and also there should be anti tank rifle on each nation it should act like a normal rife except that it can damage thin tank armor and some things you should add are bigger maps and modes such as capture the flag and free for all and a complete war mode were there are 30 vs 30 people and for the soldiers models make more of them with different uniforms that’s all I have to say if you can make it happen i will give you guys more ideas if you make mine happen that’s all I have to say. Overall a solid experience. I am a level 9 player who has had the game for about two weeks. The gameplay is almost flawless. That said, I have a few issues with the ancillary aspects of the game such as the “pay to win” aspect. Right now, most weapons in the game cost hundreds of gold. I understand that this drives revenue, but it makes the leveling process and buying new weapons agonizing. I have calculated that it will take me over a month just to make 400 gold. That can only buy maybe one weapon or chest. The reward for your efforts is not balanced, and I hope you the developers will see it in your hearts to lower the cost of gear and weapons slightly, just to make the experience more rewarding and enjoyable. If you were to do this, OR either add more weapons that can be purchased using the in game cash, I would have no problem giving this five stars. One more suggestion I have is maybe incorporate WW1 into this game. The game is called World War Heroes, not specifically WW2 heroes, so it would be great to see weapons and battlefields from both wars. In the future maybe you could add a special map like Verdun, or the Somme incorporate trench warfare and special WW1 weapons. That would definitively make this the best FPS on the mobile market. © 2017 ООО "Ласт Левел"